This course includes Lessons 1-16 from the Croatian Level 1 Program - 8 hours of audio-only effective language learning with real-life spoken practice sessions. Each lesson provides 30 minutes of spoken language practice, with an introductory conversation, and new vocabulary and structures. Detailed instructions enable you to understand and participate in the conversation. Practice for vocabulary introduced in previous lessons is included in each lesson. Topics include: greetings, numbers, meals, shopping, telling time, scheduling activities, and asking and giving directions. The emphasis is on pronunciation and comprehension, and on learning to speak Croatian. Reading instruction begins in Lesson 11 to provide you with an introduction to reading Croatian. A Reading Booklet PDF must be downloaded. Croatian, the official language of Croatia, is spoken by approximately 4.5 million speakers in Croatia, plus 1 million speakers in other parts of Europe, the US, and Canada. There are 3 main dialects: kajkavski, cakavski, and štokavski (official dialect). 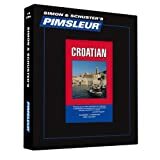 Pimsleur's Croatian teaches štokavski. Are you looking for a complete course in Croatian which takes you effortlessly from beginner to confident speaker? Whether you are starting from scratch, or are just out of practice, Complete Croatian will guarantee success! 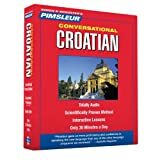 Whether you want to travel, communicate with friends or colleagues, reconnect with family, or just understand more of what’s going on in the world around you, learning Croatian will expand your horizons and immeasurably enrich your life. In the final 10 lessons, you’ll be speaking and understanding at an intermediate level. In this phase, more directions are given in the Croatian language, which moves your learning to a whole new plane. Lessons include shopping, visiting friends, going to a restaurant, plans for the evening, car trips, and talking about family. You’ll be able to speak comfortably about things that happened in the past and make plans for the future. Reading Lessons are included beginning in Lesson 11 to provide you with an introduction to reading Croatian. These lessons, which total about one hour, are designed to teach you to sound out words with Croatian pronunciation and accent. A Reading Booklet to be used with the audio lessons is also included in PDF format. Welcome and congratulations on wanting to get the basics of Croatian - a sometimes very complicated language. In this book, we’re giving you the basics of Croatian and practical vocabulary for travelers, while also conveying the basics of pronunciation and usage for those interested in delving into the Croatian language more deeply. Are YOU planning a trip to Croatia? Are YOU Moving To Croatia? Do YOU have Croatian Heritage? Be Honest how Cool would it be if YOU knew Croatian! Maybe YOU want, Impress a Beautiful Croatian women? If YOUR ready to learn CROATIAN TODAY! Scroll up, grab this book, and take the first steps to get the most out of YOUR Croatian Experience! The Pimsleur Method: the easiest, fastest way to learn a new language. Completely portable, easily downloadable, and lots of fun. You'll be speaking and understanding in no time flat! Croatian Phase 1, Lessons 1-30 includes 15 hours of spoken language practice and one hour of reading instruction in thirty, 30-minute lessons. In the first 10 lessons, you'll cover the basics: saying hello, asking for or giving information, scheduling a meal or a meeting, asking for or giving basic directions, and much more. You'll be able to handle minimum courtesy requirements, understand much of what you hear, and be understood at a beginning level, but with near-native pronunciation skills. In the next 10 lessons, you'll build on what you've learned. Expand your menu, increase your scheduling abilities from general to specific, start to deal with currency and exchanging money, refine your conversations and add over a hundred new vocabulary items. You'll understand more of what you hear, and be able to participate with speech that is smoother and more confident. In the final 10 lessons of Phase 1, you'll be speaking and understanding at an intermediate level. In this phase, more directions are given in the target language, which moves your learning to a whole new plane. Lessons include shopping, visiting friends, going to a restaurant, plans for the evening, car trips, and talking about family. You'll be able to speak comfortably about things that happened in the past and make plans for the future. Reading Lessons begin in Unit 11, and are included at the end of Unit 30, to provide you with an introduction to reading the Croatian alphabet. These lessons, which total about one hour, are designed to teach you to sound out words with correct pronunciation and accent. A Reading Booklet to be used with the audio lessons is also included in PDF format. This course includes Lessons 1-10 from the Croatian Level 1 Program - 5 hours of audio-only effective language learning with real-life spoken practice sessions. Get a chance to test drive the incredibly effective and efficient, world-famous Pimsleur Level 1 Program. Each lesson provides 30 minutes of spoken language practice, with an introductory conversation, and new vocabulary and structures. Detailed instructions enable you to understand and participate in the conversation. Practice for vocabulary introduced in previous lessons is included in each lesson. The emphasis is on pronunciation and comprehension, and on learning to speak Croatian. 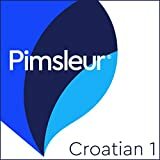 If you are beginner and ever wondered how to learn Croatian in a fast and fun way, the flash cards e-book is the answer. This practical and easy-to-understand book is based on the spaced repetition method of memorization which is one of the most efficient ways to remember words for school, work or pleasure, for kids or adults. 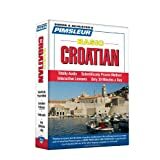 More than 300 Croatian words which are organized in 27 pages, with 12 flashcards on the each page (describing pictures with animals, house supplies, fruits and vegetables, etc.). The flashcards are beautiful designed and will help with your Croatian lessons, either you want to practice it online or print it. With every new day, you can increase your vocabulary.